Add terrific flavor to these Roasted Potatoes with bacon. 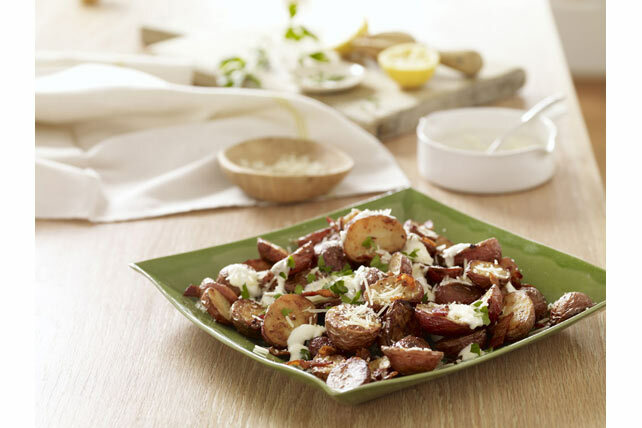 These roasted new potatoes are great with the mayo, lemon juice and Parmesan. Mmmm. Combine potatoes, bacon and dressing; spread onto rimmed baking sheet. Bake 45 min. or until potatoes are tender and crisp around the edges, stirring after 25 min. Meanwhile, mix mayo, lemon juice and garlic until blended. Spoon potatoes onto platter; top with mayo mixture, cheese and parsley. Serve this potato side dish with a crisp mixed green salad or hot steamed vegetable, and cooked lean meat, poultry or fish. For a thinner sauce, stir 1 to 2 Tbsp. milk into mayo mixture before spooning over cooked potatoes.